Those are some difficult words to hear. 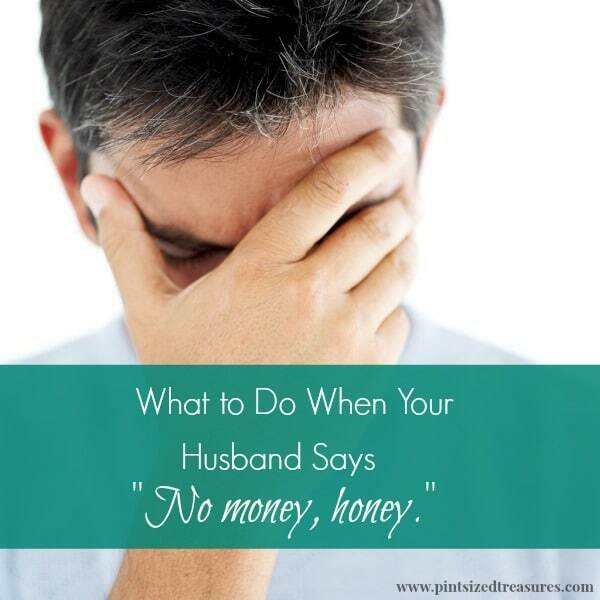 Those are even more difficult words for your husband to say. 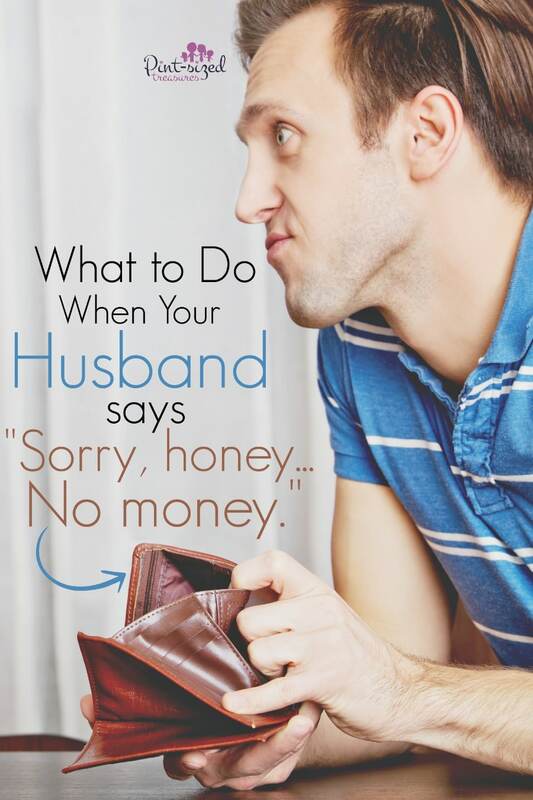 But, even in some of the most “influential” of marriages, there has been at least one time when a husband has had to break the “no money” news to his wife. Sometimes finances get tight — I mean, really tight! Maybe your husband hands you $40 to feed your family of six for an entire week and also adds he wants some “meaty meals.” True story. And here’s how you can make that seemingly impossible scenario actually work! But even after crazy budgeting and trying to stretch your income to the fullest, sometimes there seems to be no more room to pinch pennies. Not even one single, copper penny. Here’s where you have to choose to breathe. Just breathe. Most of us want to lash back with a, “Are you crazy?! There’s no where to cut back!” type of response. And believe it or not — this too shall pass. And you know what else? Many, many women have been in your exact financial, crazy-tough situation. Doesn’t it feel good to know you’re not alone? Some wives react angrily to the cease of money flow. Their anger tempts them to manipulate their husbands until he — in utter desperation — plummets into debt in order to stop the incessant whining of his wife. If you desire to react differently from those women — and I encourage you to do so — keep reading for some tried and true tips to help you and your hubby ride out this storm — together. Looking back over my marriage I can say that our toughest financial days have aided in creating a more trusting and understanding marriage. We’ve learned that we love each other more than material possessions. We’ve learned that we can actually survive on much less than we thought possible. We’ve also learned that God is still a God of miracles and works in super magnificent and unpredictable ways. We’ve learned that God always provides our needs in His time and in His way. If you desire to hold your head up and learn from this not-so-fun experience, here is some inspiration to help you deal with these financially tight days. Pray. This should be the first step, not the last. Pick a quiet time and secluded spot to pray. Pour out your heart and petitions to the Lord. He already knows your need, yet still takes pleasure in your dependence upon him to fill it. Here are a few testimonies and stories of God’s provision in difficult times to encourage you to trust Him too. Seek ways to help. Instead of pouting, think and ask the Lord for ways you can help your family’s income. Remember the virtuous woman? She made girdles and delivered them to the merchant. She also considered a field before she bought it. Want to know how I make money from home and helped our family come out of financial struggles? You can grab three lessons for free to my Smart WAHM Business course. I share my secrets to creating a dependable income from home — part-time or full-time. I even share how you can figure out what work at home business will work for your talents, your passions and your abilities. I dig into how you can succeed in working from home with young kids at home as well. I cover all the bases in a 22 lesson course where you leave with an actionable task at the end of each and every lesson. You also get added to a secret Facebook group where we share even MORE help! Working from home changed my family’s financial future — and I hope I can help you change yours! <3 Sign up for the free course today! Look around the house. Is there anything in good shape that you can sell? Decor, furniture, clothes, baby equipment, etc? Consignment shops are always looking to buy more items. Go on a scavenger hunt through your home, then call different shops and see if they’re interested in your treasures. Try to sell things on Craigslist or Ebay. If the weather permits, have a yard sale! grab some here!) and keep an eye and ear out for irresistible sales. Use what you have. Until provision is made, use the food, clothes and supplies that you already have available. Try new recipes that only require a few of the ingredients you have in the pantry. If you are lacking in the home-school supply area, check the internet for free printables, information, worksheets and games for educational help. Ask the Lord to help you use all your present items in the most efficient manner. Come up with some creative cleaning solutions made from products in your pantry! I share some of my favorite cheap, homemade cleaning solutions here and here. Keep smiling. Never become down or voice discontentment with your material state. You are promised a home in heaven, a white robe and many more treasures that we do not deserve! Your attitude affects the rest of your family. If you are content with what you have, it will be easy for your kids to follow your example. Keep being the sunshine in your home, and if you do feel discontentment creeping up inside, stop and take your attitude and burden to the Lord. Have you faced this financial crisis in your marriage? How did you handle it? Have you found a way to earn more income form home to help your family? 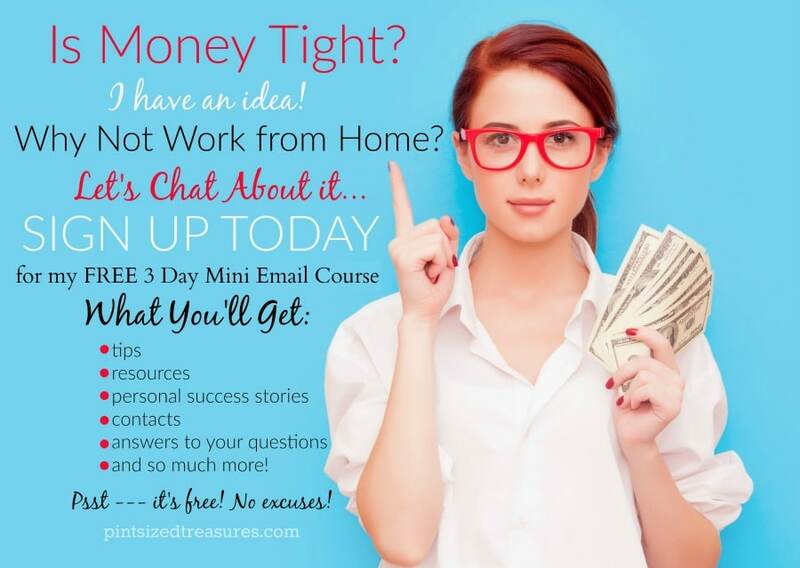 Don’t forget — I share how I earn an income from home and teach you all my secrete-secret methods to becoming a smart, successful work at home mom in my Smart WAHM Course. Check it out below! *Affiliate links have been added to help you save money!